Crisis In Japan: Radiation Detected In Seawater; Frustration Grows : The Two-Way The water that was used to cool reactors at a crippled power plant in Fukushima may itself now be carrying radiation into the soil and sea. Meanwhile, people who fled their homes near the plant are growing increasingly frustrated. 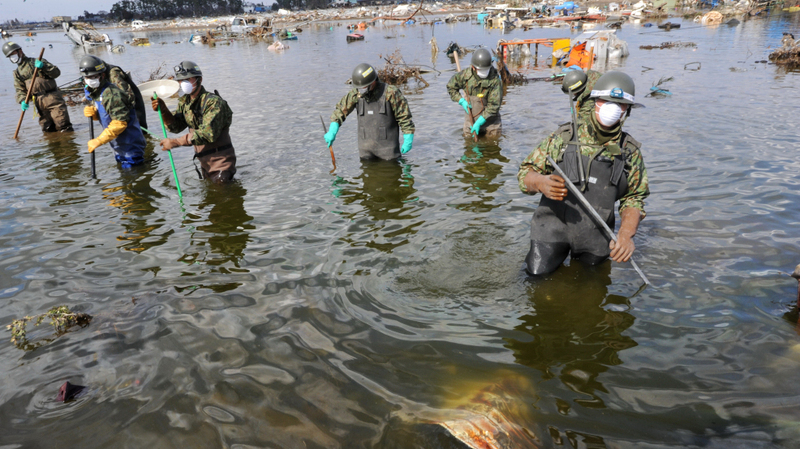 In Sendai, which is outside the evacuation zone around the crippled Fukushima nuclear power plant, members of the Japanese Self-Defence Force searched for bodies today (March 28, 2011). Japan continues to struggle with the lingering effects of the devastating March 11 earthquake and tsunami that pummeled cities along its northeastern coast and crippled a nuclear power plant in Fukushima. At that plant today, workers "raced to pump out contaminated water suspected of sending radioactivity levels soaring as officials warned ... that radiation seeping from the complex was spreading to seawater and soil," The Associated Press writes. As NPR's Jon Hamilton reports from Tokyo, "for many days now, crews have been flooding [three of the plant's reactors] with water" to cool overheated reactors and storage tanks. Now, "some of that water has apparently become radioactive" and has pooled in the reactors' basements. That contaminated water, in turn, has made it unsafe for workers to stay in those areas for more than 15 minutes or so at a time. At one point yesterday, Tokyo Electric Power Co. mistakenly said that radiation levels in some of that water had spiked to 10 million times normal levels. It later said the increase was to 100,000 times normal — still a highly dangerous development. Jon also says that water used to cool the reactors has apparently filled a series of underground tunnels at the plant — and that there are fears that water could get into the nearby sea. An effort is now underway to remove that water. Meanwhile, people who have evacuated their homes in a wide area around the plant are growing increasingly frustrated, NPR's "Jason Beaubien reports from the city of Sendai. There have been reports, he says, of some people entering the official 12-mile evacuation zone. "We're hearing from people of great frustration," Jason says. "They evacuated quickly, they didn't bring many belongings with them and they are not being allowed back in." The Japanese government, he says, continues to urge residents not to try to go back. Also today, according to NHK, Japan's National Police Agency said that it now estimates that more than 28,000 people are dead or unaccounted for: "10,901 people had been confirmed dead and 17,621 listed as missing." "The contaminated water must be removed and safely stored before workers can continue to repower cooling systems critical to keeping nuclear rods from dangerously overheating. The facility's systems were knocked out by the magnitude 9.0-quake and massive tsunami that struck Japan on March 11." Update at 10:05 a.m. ET. More On Water In The Tunnels. "High levels of radiation exceeding 1,000 millisieverts per hour were found in water in a trench outside the No. 2 reactor's turbine building at the troubled nuclear power plant in Fukushima on Sunday afternoon, Tokyo Electric Power Co. said Monday. "One end of the tunnel-like trench is located about 55 meters from the shore, with the surface of the water staying about 1 meter below its ground-level hole. But no trace has been confirmed of the contaminated water having flowed into the sea, an official of the company said."